My kids and I have a finely developed routine when we visit the doctor. Doctor appointment. Pet store. Chipotle. Cookies. It has been scientifically tested and approved over the last several years by our sub-committee of three. A few weeks back we went in for annual physicals. Despite some pre-doctor trepidation concerning the possibility of shots (possibly fueled by dad), my two offspring were well behaved and looking forward to our post-appointment ritual. Both kids were determined by the pediatrician to be tall, skinny and healthy. Plus, there would be no shots this year. We hastened on our way to the pet store to begin the no-shots celebration. Since I can remember we have visited the puppies in the window of a Sixth Avenue shop. Horror of horrors! The shop is closed and the puppies are gone. This threw our schedule off balance and our well-knit team began to unravel. What started as sniping and teasing in Chipotle had become guerrilla warfare as we headed east on 8th Street to Insomnia Cookies. My son and daughter had turned against one another and both angry words and threats of violence passed between them. With frowns and cookies we wandered into Washington Square Park. Our usually blissful meandering afternoon in the city had become a nasty forced march. By the fountain I sat down to negotiate a peace between the warring parties. The 90 degree plus heat and humidity wasn’t helping. One faction was sulking, while the other was exercising his vocabulary of borderline curse words. Then something happened. The little one stuck her toes in the water. The older one kicked off his Crocs and stepped right in as well. Despite signs declaring the fountain off limits a few other kids had dared defy the law and were cooling their heels as well. Leave it to my kids to up the stakes and dash into the jets, soaking their clothes and encouraging cheers from the dozens around the edge of the water. Several other kids dashed in. I feebly protested, but the huge grins on my kids’ faces and the ensuing free-for-all silenced my inner hall monitor. Shortly the recent enemies emerged from the mayhem they instigated, dripping, laughing and best friends once again. My kids provide me with great lessons sometimes. It’s my job to teach them right from wrong, but they show me that occasionally you have to break the rules and be a kid to really enjoy life. 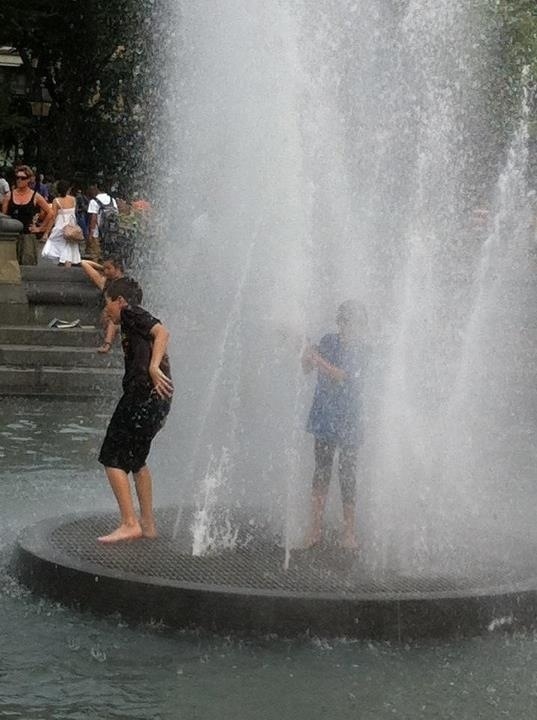 Lately when I get off the PATH train in Hoboken on a hot day I almost always head straight to Pier A Park and wet my face and head in the cold spray of the fountain. Yes, my shirt (and sometimes my bag, pants and shoes) gets wet and all the adults stare at the guy soaking his head in the water, but the joy, freedom and refreshment make it all worthwhile. Go ahead. Stick your head in the fountain.